Business Combinations – Dynamic Financial Adviser HTML Website Template is carefully designed specifically for marketing agencies of financial advisors. 7 gorgeous homepage layouts are already available for users and some more are currently developed by our professional designers. The template is fully customizable; you will be able to change every element according to your taste. There are more than 50 content blocks that could be used for website finalization. Plastic Goods Website Template- if you’re an industrial company owner and you want your company to have an attractive and detectable website, use our fully responsive Industrial Company HTML Template and you’ll never have to worry about drawing your clients to your website ever again. Developed by a team of professional web developers after the thorough analysis of many industrial company websites, this template offers everything you need. Fast response rate, intuitive interface, stunning artwork and fully adjustable looks with blogging and social network support. ABCD is modern multi-purpose template. ABCD is a Responsive HTML5 / CSS3 simple, clean and Professional theme. This theme suitable for Company, Business, Blog and Portfolio and much more. Create Outstanding Website or Blog in Minutes! Moreover, thus it carries a lot of useful features, for instance additional HTML elements, set of CSS components, grid system and much more. FlaNo is a fully responsive HTML template based on Twitter Bootstrap. This template contains a lot of elements and will help you reveal all the necessary features of your company. The spacious content area is improved with beautiful high-resolution photos that will visually put your customers on the right track. Moreover, thus it carries a lot of useful features, for instance additional HTML elements, set of CSS components, grid system and much more. Mimba is a 100% responsive and parallax Multipurpose template. Mimba is powered with Bootstrap Framework. The Bootstrap Framework makes it fully responsive to all screen resolutions and aspect ratios. All files are well organized and documented so anyone can use, modify or customize this template. It can be customized easily to suit your wishes. A high-class, top-notch HTML5 template designed strictly for business. Blockus is one of the cleanest and powerful design to let you introduce your Startup project. Well Organized and valid code, is perfect for every creative, corporates, agency and business. Moreover, thus it carries a lot of useful features, for instance additional HTML elements, set of CSS components, grid system and much more. It carries a lot of useful features, for instance additional HTML elements, set of CSS components, grid system and much more. Well-written documentation will help you seamlessly set up the desired site with engaging design and rich functionality. MinimAll is a Responsive multipurpose bootstrapped template. The Bootstrap Framework makes it fully responsive to all screen resolutions and aspect ratios. Moreover, thus it carries a lot of useful features, for instance additional HTML elements, set of CSS components, grid system and much more. Well-written documentation will help you seamlessly set up the desired site with engaging design and rich functionality. Civil Architect is a one-page HTML template, offers a professional overview of your company’s profile, it will work for corporate or business sites of any kind, with some quick adjustments it can also work for media, creative agencies, artists, models, etc. websites. It features a clean and minimalist layout that makes the content look clear and organized. The theme offers a clean code that ensures faster loading speeds and higher rankings in search engines. This template contains a lot of elements and will help you reveal all the necessary features of your high-tech company. The spacious content area is improved with beautiful high-resolution photos that will visually put your customers on the right track. 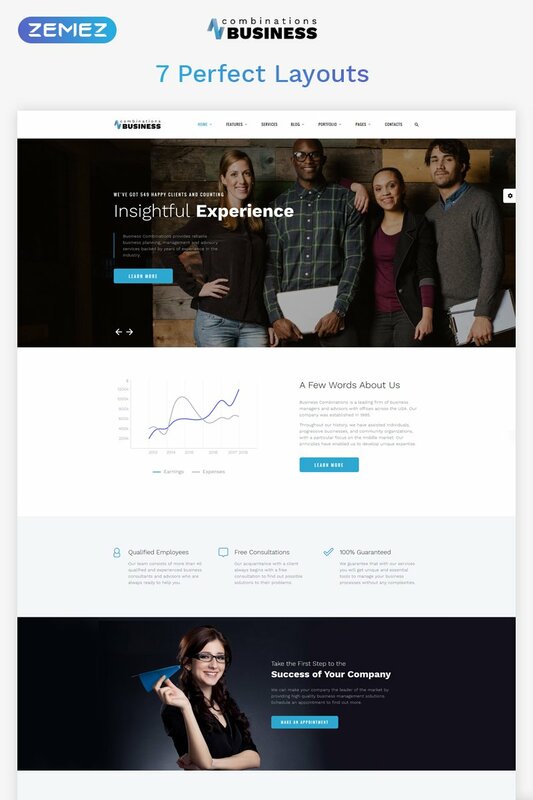 This one-page HTML template offers a professional overview of your company’s profile, it will work for corporate or business sites of any kind, with some quick adjustments it can also work for any other websites. it is best suited for business websites, however with some quick adjustments it can also work for media, creative agencies, artists, models, etc. Reliable is a 100 responsive and cross-browser compatible template built with valid HTML5 and CSS3 standards. It based on solid code and the brand new Bootstrap v3.3. It makes use of modern jQuery and CSS3 techniques to create superb eye-catching animations and make your visitors love you and your website.